The problem with the lady pouring from one jug to another being Fama in the early tarot, i.e. by mid-15th century, is that it would appear to be a late, i.e. 16th century, attempt to put Fama in the right place by retitling the Temperance card. She obviously has Temperance's attributes, and no wings early on, even in the minchiate. mikeh wrote: How many examples do you have of sets of precisely 14, or 21, Dante illustrations on the themes you propose, in any medium (but explicitly related to Dante)? However I do not think that in either case it is a relevant question. The fundamental difference between the supplemented-Petrarch and Dante theories is I don't look beyond Dante for my subjects - he has a tripartite structure (3 x 7) to the "church militant" section of his Paradiso which provides the 21 subjects, to which is appended a God-denying Fool (the damned in the Inferno if you will). You pick and choose from three different sources to piece together sources for your 16 subjects without any rationale other than you were presented with those 16 subjects to begin with (or rather you chose those 16 subjects from a field of 22). What is the rationale for your 16 subjects from three different sources, and why was it significant in the year(s) you propose for the ur-tarot? Phaeded wrote: What is the rationale for your 16 subjects from three different sources, and why was it significant in the year(s) you propose for the ur-tarot? 16 trumps in the Michelino deck. 16 reconstructed trumps of the 11 trumps of Cary-Yale. 16 trumps of the Charles VI (if one assumes, that this collection is complete). 16 figures in the Bruzio Visconti manuscript. 16 Greek/Roman gods in the chess allegory of Evrart de Conty. This was from myself, not from MikeH. One argument (or better "suspicion") is, that the 60-cards-model for the Michelino developed from the 60-cards-deck, described by John of Rheinfelden (or a similar deck with 60 cards) much earlier (1377). This older deck was likely produced in Bohemia (it had professions for the number cards, the Hofämterspiel - produced in Bohemia later - also used professions for the number cards). The Empire was then ruled by a king of Bohemia, Prague was the capital of the Empire. In 1395 (F.M. Visconti 3 years old) a Milanese delegation visited Prague to negotiate the duke title for Giangaleazzo Visconti. King Wenzel agreed, but this was a bad business, cause German nobility didn't agree with this step. Wenzel lost the throne 5 years later. At this opportunity a 60-card-deck (or some more) might have reached Milan and the Visconti court). Filippo Maria had playing cards in early youth, this is reported by Decembrio in his biography. If the Michelino had indeed 60 cards (some doubt this), the 16 trumps of e Michelino might have come from this deck type. Evrart da Conty had arranged 16 Greek/Roman gods in his interpretation of the poem Eschecs amoureux (a sort of encyclopedia arranged in a chess frame) in the year 1398. The text might have been known to Filippo Maria, and he might have been inspired by it to initiate an own system with 16 gods. Filippo Maria used in his card deck the 12 Olympian gods ... this idea likely was inspired by the new finding of the Manilius text, who had used the 12 Olympian gods in his astrology system. Manilius had nothing with the number 16, as far I know, but I think, that it was an important influence on Filippo Maria and his deck creation. Filippo Maria had a lot of astrologers and the Manilius system is very different to other astrologies, so the Manilius text should have triggered controverse discussions. The Michelino deck as an alternative interpretation of the 12 Olympian gods might have bbeen an argument in this discussion. I have edited my post at viewtopic.php?f=11&t=1120&p=17956#p17956, presenting Shephard's table relating Petrarch to the tarot sequence, by including, at the end of the post, links to jpg's of all of his chapter 5, which gives more explanation and justification of his ideas. The most obvious and secure aspect is the presence in the evening procession of representatives of the sixteen separate urban districts in which the city was divided, four in each district, as follows: Santa Maria Novella: Viper, Unicorn, Red Lion, White Lion: San Giovanni: Gold Lion, Green Dragon, Keys, Vaio [grey fur of the Siberian squirrel, very fine, Franco tells me]; Santa Croce: Chariot, Ox , Black Lion, Wheel; Santo Spirito: Ladder, Shell, Ferza [a kind of whip, Franco tells me], Dragon. The 4x4 nature of this array also of course relates to the structure of the Marziano and the CY (consistent with the hypothesis that the Beinecke assignments to suit is that old). Dai dati presenti nell’elenco riportato sopra, si può concludere che nel 1445 ci furono molte più condanne per giochi di carte che nei decenni vicini. Se ciò corrispose a un effettivo rafforzamento dei controlli proprio in quell’anno e forse in anni vicini è possibile, ma difficile da verificare; per capire meglio la situazione, sarebbe utile un’ulteriore indagine centrata sul decennio 1440-50. Similmente speculativo rimane qualsiasi tentativo di collegare queste condanne dei giochi che si facevano con le carte comuni proprio nel momento in cui si stavano diffondendo i trionfi, i nuovi mazzi di carte speciali che si utilizzavano in giochi che in genere erano permessi. Sarebbe di grande interesse trovare in questi libri qualche citazione che testimoniasse la comparsa dei primi trionfi, ma se per un gioco di carte non era possibile infliggere condanne era proprio quello, insieme alla diritta e a pochi altri. ..but the special cards were used in games that, along with diritta and a few others, were generally allowed and it was hardly possible to impose penalties for that one. ... but the special cards were used in [a type of] games [i.e. trick-taking] that, along with diritta and a few others, were generally allowed, and it was hardly possible to impose penalties for that one. In other words, if diritta is exempt from the prohibitions, then other games of that type would likely be tolerated, and so we would not expect there to be convictions for playing them. The reason for toleration is that trick-taking games are not pure chance, but involve skill as well, which in the long run is decisive. That in 1444 two people were convicted for playing such a game might be quite fortuitous (for us, and something he did not expect); there might have some particular reason for that exception. I have suggested that playing any game for money close to the prison might have been forbidden, as it might be seen as a temptation for those imprisoned for lack of money. There are other possibilities: an overzealous new prosecutor, for example. The net result is that even if nothing is found in the registries for years before 1440, it does not show that trionfi was not available in cheap decks and played widely in those years, because that type of game might have been tolerated, even if not explicitly exempted by the statutes. Nonetheless, Franco is searching the pre-1440 registries, even without expecting to find anything of interest. The main problem involved in finding precedents for the triumphs in literature and art is that of finding ones that account for their sequential order. With the numbers not on the cards, the main point is the necessity for a narrative that accounts, more or less, for the order. As far as I know, you have not dealt with that issue at all. Your planets, virtues, antitypes and exemplars are all over the place. Petrarch's poem gives a rationale for the order, more or less, not only for the 21 but for shorter versions, with the other cards, added in groups from other narratives, as subsidiary parts of that order. Virtues and anti-virtues do not, by themselves, lead to an order. The planets do come with an order--several of them in fact--but you haven't tried to impose one on the cards. Shephard, in The Tarot Trumps: Cosmos in Miniature (1985), did try to make the planets correspond to the at least the first 14 cards in order, using two orders of planets, those determined by the progression of "rulerships" in the zodiac on both sides of July-August; but even he couldn't fit all 14, and found it to fit only the later Tarot de Marseille order; for the last 7 he used the planets again, but not in any astrological order, using instead Plutarch's On the Face of the Moon, this latter of which I agree with, more or less. Perhaps, Phaeded, you can improve on this effort and develop a coherent order based on Dante. Perhaps the main reason for this note derives from my senile dotage, which proceeds inexorably. It deals in particular with considerations that are not based on new documents of the time, or even on other recently published studies; I rely here mostly on imagination, which for historical studies can hardly be regarded as a suitable guide. In addition to this first reason, of a general nature, I have to explain the particular motivation that led me to return once again to commenting on something that I had already written. The passage of mine to be commented on is reproduced below. The most unusual and curious thing is that I'm quoting here my earlier quote of an even older writing of mine. (1) We try to make order, since this is the starting point, and explain why we have to go back. registers of the forties of that century, was finished, I allowed myself to quote again my comment earlier, to justify this new study carried out without foreseeing the result and to emphasize my surprise at having found registered even two cases of triumphs games in 1444. Now I consider a third time necessary to return to that comment, because ultimately it proved too difficult or wrong ... for translating into English. Permit me a digression ... a linguistic one. On card games and playing cards I have written many notes for many years; I have often faced the dilemma of whether to write in Italian or English. I write in English with an ease almost equal to writing in my native Italian, but with some understandable differences. One difference is subjective: even writing in Italian I am sometimes uncertain about the correctness of some expression, but in English I'm afraid of slipping on a banana peel at every step. The other difference is objective: the Italian language has remained closer to Cicero's prose and, if desired, sentences can be filled with complex syntax and subordinate clauses. Even our use of relatively common verbs in the subjunctive and conditional usually is difficult to render fully in English. The conclusion to the above is that if I write in English I begin with a preliminary reduction in the complexity of thought, trying to direct it towards shorter and better coordinated sentences, especially avoiding long convoluted ones. Nevertheless the result does not reassure me, because my "English ear" is not fine enough to recognize the flaws, the imperfections of style to even the grammatical mistakes. At the beginning of my interest in these matters, I had the good fortune to encounter in English-language experts precisely those responsible for the activity of IPCS and its official organ. If I wrote in my English, I could be certain that Sylvia Mann and Michael Dummett, or one of those following them responsible for the publication, always British, would have at least removed the most obvious errors from my text. Returning to write my notes on the subject after a break of at least ten years, I have not found (with one exception) a sufficient interest from British members who would make themselves available to review my writings before publication. With the above, and with my increased laziness, can be explained the fact that from a certain moment on, I decided to limit myself to writing in my own language, utilizing thus also the ability to better argue my discussions, and in greater detail. At one point intervened, unexpectedly, the good will of Michael S. Howard who gradually inserted in the Tarot History Forum and in his blog (3) almost all of my most recent notes in English translation. When I read Howard’s English I feel respected and honored beyond my merits; in particular, if I wrote my text directly in English would have simplified quite a lot of those sentences. As I had already verified in other areas, educated Americans have less difficulty and more patience than the English in supporting styles far from their own; personally, I would write very differently, but they bend their language as much as possible to agree with that of others. respond as usual with a single line, but I need these several pages. Howard’s appropriate objection to that passage, which makes it impossible to translate without feeling unfaithful either to the text or to the reality, was expressed as follows. Unfortunately, I am not able to respond accurately based on the documents of the period. I'll try to use all my imagination and explain what can be proved. But I have to introduce the topic, starting from afar, from other games that were popular even before the arrival of the playing cards. Before the spread of playing cards there existed other types of games, significantly different. Chess was considered the noblest game, so much that it was rarely banned by the municipal statutes; in the few cases of prohibitions one can assume that it was a forbidden variant of the game where the moves made on the board were dictated by the roll of the dice. The dice games, such as Zara, the most popular, were usually at the opposite extreme and were always prohibited. An intermediate position was occupied by board games; they moved the counters along a given path according to the points made with the roll of the dice. Despite the fact that the points of the dice were obviously linked to the case, alternatives existed on their use, such that the game had to be considered to be of mixed type, i.e. intermediate between those of pure chance and those reflection. Unlike chess, these games could not be done without dice. Thus there was a serious problem if it was desired to allow them the character of an intelligent game. Because the contrast to games of dice was efficacious, it was necessary to prevent an easy subterfuge on the part of the players. The players of dice games, including zara, could use a board similar to the one with twelve rows still known today from backgammon, and use it only as a board on which to roll the dice. It was enough to keep the board stationary next to the pieces, never using it, so as to show any guards who caught them in the act: they were playing a board game and were about to start the game, which is started with a first roll of the dice to arrange the pieces on the course. This explains the warning that we often find in municipal statutes: board games are all prohibited except ones in which at the start all the pieces are placed in predetermined positions on the board. Evidently, all those variously placed pieces on the game board made it no longer suitable for rolling the dice in games of only dice. So far I have not used my imagination, just documented facts. The defect is that we are off the topic of playing cards, but only up to a point, because the same problem is also found for them. Like board games, card games also often have an intermediate character between games of pure chance and games of reflection: the cards are dealt randomly, but their use in the game can usually be made at the player's choice and thus in the long run an experienced player will have the edge over their opponents. of the fourteenth century Giovanni Morelli considered naibi among the recommended games for children (5); evidence of that kind can hardly be found in the Books of the Lily. Among all the card games, the first to be allowed in the Florence area was usually diritto, which seems to have been a trick-taking game; it also seems likely (but not sure!) that it did not associate the trump function to some cards in the deck of naibi [ordinary cards]. When naibi a trionfi [triumph packs] appeared, for sure the added cards had precisely the trumps function in a trick-taking game, at least for capturing the most cards, but also, for some, different scores, associated perhaps with picture [i.e. court] cards, or combinations thereof. Most likely, the deck of triumphs did not introduce an entirely new game; sometimes we read of a rectus ludus Triumphorum, as if it meant a game of triumphs played "in the style of diritta". The game of diritta with naibi had become a traditional and allowed game; if the the game of triumphs was played in a fairly similar way, despite the diversity of the deck, you can understand that very quickly it avoided the suspicion usually reserved for a newly introduced game: thanks not to the new deck used, but to diritta’s being played previously with the common deck, it could immediately qualify as a traditional game.. Indeed, control could in that way even become easier. What was the difference between playing diritta and playing triumphs? Now the deck of cards used was different and this was a clear advantage for those who were in charge of controlling the type of game. For players surprised with the cards, it would not be easy to prove they were playing one of the few allowed games. The game that was usually played with a pack of triumphs, however, belonged to the dirrita type of games, which was the first to appear in the laws as permitted exceptions among the forbidden games. 5. Istoria fiorentina di Ricordano Malespini. Florence 1718.
tolerated by the authorities. If there was a pack of cards for which production and use had to be permitted, it was precisely that one, of triumphs. In conclusion one can easily assume that the game of triumphs was accepted early on, before its name could appear explicitly in the Florentine laws of 1450; for games, a requirement that generally favored the exclusion from those prohibited was just that it was considered a traditional game of the population. It does not seem logical to assume that for that time a given game passed in a short time from being strictly prohibited to becoming authorized for all: very likely that game came to be tolerated in practice even before become formally writen into the law. There are in short the most compelling reasons to consider as very exceptional the sentences found in Florence in 1444 for two players of triumphs, those in the above quote that I foresaw would not be possible to find. Now that I am giving free rein to the imagination I can try also to go one step further, so as to arrive at the final form of Florentine triumphs. The initial form is not known with certainty, but the finish is certainly made up of the ninety-seven cards of minchiate. If desired, it is easy to assume that the uncomfortable number has been achieved with the addition of only one card to a more reasonable deck of cards of ninety-six; there still remains the problem of explaining the reason for all that group of added cards. As far as I know, Florentines then (and to some extent today) see a chance corresponding to a ... a reaction gesture. Evidently I am still working only in fantasy, but I like to think that the initial Florentine triumphs had fewer than twenty-two triumphal cards. I imagine then that pack of triumphs "returned" to Florence enriched to include all the traditional added twenty-two cards. The understandable reaction of the Florentines would be then: if you think you can increase our deck in order to make a more complex game, we can accept the challenge and indeed raise it so as to take back the preeminence among all competitors; no one can surpass the genius of the Florentines (at least then)! Previously I had written, and moreover in a not very clear way, that in Florence the triumphs game could be considered allowed even before 1450, when it was approved with the provision that for the first time included it among the card games excluded from the prohibitions. In this note I have tried to justify and make explicit that hypothesis of mine. Of course I lack any document in this regard; the reasoning I have followed is entirely hypothetical: the introduction of the same triumphs would be explained as a way to make it easier to accept the deck of playing cards and its use in the hands of players. Once I permitted myself a work of fantasy, I finished by looking also for an explanation for the later use in Florence of the typical pack of minchiate, hypothesizing that it was created as a reaction to make the Florentines conquer - or perhaps reconquer - even in card games the primacy that at that time they were trying to reach in every field of production, whether in manufacturing or intellect. Today, after posting my translation last night (at viewtopic.php?f=11&t=1120&start=50#p18092), I realized that Franco had made some additions to his essay after the pre-posting version he had sent me. I have now edited the translation so as to include them. These additions are in section 4 only. Franco has a new note, this one reporting his search in the "libri del giglio" for all the years 1426-1440, done with no expectation of anything interesting and not, in that regard, either disappointed or surprised. 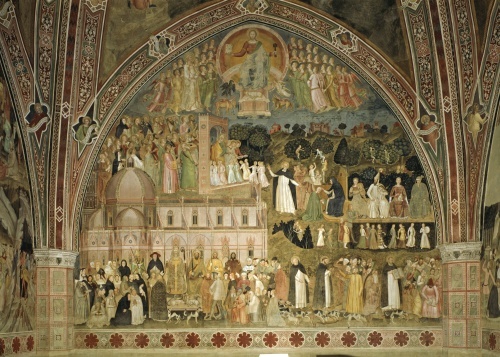 The original, "1426-1440: Firenze – Condanne per giochi di carte nei Libri del Giglio", is at http://www.naibi.net/A/524-GIGLIO26A40-Z.pdf, dated Nov. 26, 2016. Comments in brackets are by me. I thank Franco for help in translating some of the more unusual words. In the last two years I have studied many times the Books of the Lily, containing the official records of the special revenue of the court [camera] of the commune, preserved in the State Archives of Florence. My attention was drawn especially to the fines paid by gamblers [giocatore d'azzardo] caught in the act. In the fifteenth century, with advancing years, it is observed that these documents for fines for games [gioco] become less frequent, until they disappear altogether. Also because of this observation, I decided to study year by year the records up to 1425 only [starting at 1401] (1), then moved to one sample study, of a book every five years, until the end of the series (2). 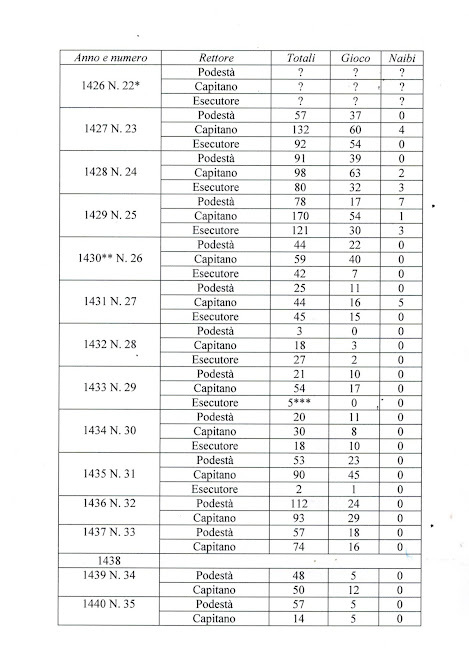 From this sample study it turned out that the year 1445 had a record of infringements of interest much richer than average and this figure abnormally pushed me to resume the study and examine individual annual records for all the 1440s. After that further investigation, not planned initially, I saw no need to continue to examine those records again, and in particular to consult even those which I had hitherto neglected. Among other things, for the years that were left without documentation from this series of books, there was already some indicative data from the Captain's documents and the conservators of the laws. Personally, I did not expect anything important from an examination of the records not studied and considered that quest completed. Some discussions recently appearing on the Tarot History Forum have been a push to return to consulting these books. Evidently some experts count on the possibility that, also studying the neglected books, one could find other significant data, like the two triumph players who unexpectedly appeared in 1444. The hope - or illusion as it may be - above all concerns the possibility of finding here some games of triumphs documented before 1440, the earliest date known today. At least one expert (present as Phaeded on Tarot History Forum, but there will probably be more than one thinking like him) is convinced that the triumphs entered the playing cards as a result of the Battle of Anghiari (3). Then it is obvious that it would be enough to find some triumphs player sentenced before the battle to immediately refute that theory. But even without an interest in the case, to go back a bit further in time and get closer to the origin of the triumphs seems desirable to all experts: any step forward, however small, would serve to simplify the discussion; the views expressed in this respect differ only on how far back in time it is reasonable to go. I have consulted Books of the the Lily No 22 to No. 35 inclusive, that is, from the year 1426 to 1440, as indicated in the table with the relevant data. These books were compiled annually by notaries of the common room in Florence, using sheets of large paper (about 40x30cm) and thicker than average, bound in parchment and often with a beautiful shield painted on the cover containing the red lily, the emblem of Florence. Most of the books examined are formed of 96 pages, but some have different numbers; the number of total pages, however, is not very significant, given the significant presence of white pages left over. To compile these books there was a standard procedure, so that a given year could serve as a model for the next year’s book. The clerk in charge of compiling began with the number the pages and assigned a preset number to the various sections. The first section was always reserved for the podestà [like a mayor]; the previous page usually contained an index which referred to the initial page of the various subsequent sections. The second section was the captain of the people, and began as a rule at c. 10r or 12r (but in the early years considered starting from c. 20r, thus leaving more room for the podestà’s convictions). The third section was the executor of the systems of justice and typically began at c. 18r. Subsequent sections are not of interest to us because they concerned revenue from other types of fines - absence from guard duty or council, women with too rich attire – or other revenue such as bail bonds for the Stinche [Florentine prison], or the amounts for rector leave permits (due to temporary absences from the office headquarters). In rare cases, the required pages for a given section were insufficient, and thus a second section was opened in the remaining white pages in other sections. Much more commonly encountered was the opposite case, where the pages reserved for a given section remained largely empty: if you took out the white pages, these large volumes would become very thin files. More details on each of the manuscript of the whole series can be found in the Inventorio dedicated to these books (4). We are interested only the first three sections, of the podestà, the captain and the executor These three foreign rectors and the respective groups of notaries and guards had various tasks, and the activity that we encounter documented here was certainly secondary. For our part we cannot make a distinction among the three personages and study them together regarding what was collected in these books. What is involved is in any case the registration of the commune revenue established in these three sections, however, exclusively in fines paid by those who were caught in the act carrying weapons, gambling [giocare d'azzardo], or going out at night. Our interest is limited to gambling games [giochi d’azzardo], especially looking for players of naibi. These infringements were initially controlled only by the three foreign rectors, but in the time of our interest the executor's office was abolished and for these tasks of civic policing the podestà and captain were put side by side and gradually replaced by conservators of the laws and the eight of the guard (of whose documents of that time, however, we find only fragments). 4. Archivio di Stato di Firenze, Inventario V/500. triumphs, we cannot reconstruct exactly the situation at the time. For one thing, it should always be remembered that here you only see cases where players were caught in the act and forced to pay the fine, while countless other cases could be accounted without incurring penalties. The main shortcoming of this data for our purpose is, however, that the type of game is almost never distinguished. The game of Zara [a dice game], which probably was the most widely played, is explicitly mentioned in a very small part of the records. I summarize the figures in the table below, in which the last three columns are reserved for the total number of fines, the total of those for games and the number of those which indicated explicitly cards or naibi. The year in question is the main one of the register, but in fact the documentation always begins in these books with 1 February and ends in January, inclusive, of the following year. A detail that I did not follow, but which could be studied with profit if one wanted to go more deeply, is the assignment of the data in correspondence to the rectors: the office of foreign rectors usually lasted six months and fines recorded in each section of the book are usually by the action of three different groups present one after the other, that of the central half being wholly one group; but at the beginning the records match the final activity of the previous group, while the last record is associated with the initial activity of the group that was then beginning its duty. If two successive rectors had a very different attitude in controlling offenses - one more rigid, one more tolerant - we might see here a behavior in essence corresponding to the average between the two. These cautions are intended to once again warn against a supposed statistical validity of the data collected. The reported figures are in fact considered as guidelines. If this were not enough, I can add that I have counted the items only once, without checking the number (something that with numbers you should never do), so that in the data listed there may be some elementary errors. *No. 22 is severely damaged; there are only fragments of a few pages, and not of the first three sections of interest. **Here the fines for absence at council are not counted, which in other books are listed separately. ***The entire c. 18, which contained most of the executor's records, is missing. Especially in the particular case of card games it would be absurd to use these results to obtain statistical evaluations, the number of cases not being obtainable in which the game indicated without specification could be that of our interest; This applies particularly to cards and naibi, but at the limit could also relate to triumphs. The number of naibi players we find here is only a small part of the whole. In the first place it is possible, and in some cases could be confirmed, from the books of the rector who had made the conviction, that the cases here registered simply as “game” might have been regarded precisely as the game of naibi. The situation could have been much more favorable for us if the card games were punished by a fine different from dice games; but instead, being only the fine, the record did not distinguish what case it was, with certain exceptions. It seems clear from various indications that the players punished by the foreign rectors’ groups were only one part even among those surprised playing. Generally it seems to convey a not very severe attitude by the guards. Even in the worse alternative of captures, in a substantial number of cases an anonymity is allowed to the incriminated, with which they avoided at least the most severe penalties, established for repeat offenders; that in itself is a clear indication that the guards acted with considerable autonomy. Often one gets the impression that one player was punished for all, maybe choosing a foreigner or a Florentine poor person. Even more indicative are the frequent records of coats or other clothing items left by the players who managed to escape from the place of the crime. The indicted would not be able to escape capture so easily if their escape had not been most often permitted, if not favored, by the same guards. To confirm this assumption we find that in many cases we do not read that the coat in question had been abandoned, but it is frankly written that the coat had been tolto a uno che giuchava, removed from one who played, by guards. current of writing the final i at the end of any word; the date of capture is entered in yyyymmdd format. (Cap) c. 16v 14271010 Uno mantello tolto a uno che giuchava a naibi. (Cap) c. 17v 14271125 Uno mantello romagnuolo tolto a uno che giuchava alle charte. (Ese) c. 22r 14271226 Uno mantello turchino tolto a uno che giuchava overo stava a vedere al giuocho delle charte. (Ese) c. 22r 14271226 Uno mantello di panno nero a uno che giuchava come sopra. (Cap) c. 16v 14271010 One coat removed from one who played at naibi. (Cap) c. 17v 14271125 One coat of Romagna removed from one who played at cards. (Exe) c. 22r 14271226 A blue coat removed from one who played at cards or was observing the game of cards. (Cap) c. 13r 14280405 Piero d’Antonio calçolaio preso perché giuchava alle charte. (Cap) c. 13v 14280418 Uno che non volle dire il nome trovato giuchare alle charte (altri sembrano insieme ma non è specificato il gioco). (Ese) c. 22v 14281114 Guasparre di Zanobi chalzaiuolo popolo di Santo Piero Magiore preso perché fu trovato giuchare al giuocho de naibi. (Ese) c. 22v 14281114 Francesco di Giovanni di Salvi popolo di Santo Piero Magiore preso perché giuchava a naibi. (Ese) c. 22v 14281114 Jacopo di Piero di Santi popolo di Santo Ambrogio perché giuchava al giuocho de naibi. (Cap) c. 13v 14280418 One who did not want to give his name found playing at cards (seems with the other but the game is not specified). (Exe) c. 22v 14281114 Guasparre di Zanobi chalzaiuolo [stocking maker] district of San Piero Magiore taken because he was found playing at game of naibi. (Exe) c. 22v 14281114 Francesco di Giovanni Salvi district of Santo Piero Magiore taken because he played at naibi. (Pod) c. 4v 14290702 Jachopo di Pace di Chasentino furono trovati giuchare ale charte. (Pod) c. 6r 14290913 Michele di Michele da la Magna fu preso per giuocho de le charte (battezzato). (Pod) c. 6r 14290913 Romanello di Christofano da Roma fu preso per giuocho de le charte. (Pod) c. 6r 14290913 Antonio di Chola da Viterbo fu preso per giuocho de le charte. (Pod) c. 6v 14290918 Uno mantello di cholore cilestrino duno che si fuggì che giuchava a naibi. (Pod) c. 6v 14290918 Uno chappuccio di cholore cilestrino preso per giuocho di naibi. (Cap) c. 16r 14290719 Antonio di Mateo da Firenze fu preso per giuocho de naibi, overo charte. (Ese) c. 18r 14290205 Due sanza nome furono presi per giuchare alle charte fuori della porta. (Ese) c. 20r 14290703 Antonio di Stefano di Francesco popolo S. Lorenzo di Firenze fu preso per giuocho delle charte de naibi. (Pod) c. 4v 14290702 Jachopo di Pace of Chasentino were found playing at cards. (Pod) c. 6r 14290913 Michele di Michele of Germany was taken for game of cards (baptized). (Pod) c. 6r 14290913 Romanello di Christofano of Rome was taken for game of cards. (Pod) c. 6r 14290913 Antonio di Chola of Viterbo was taken for game of cards. (Pod) c. 6v 14290918 One coat of pale blue color from one who fled who played naibi. (Pod) c. 6v 14290918 One hood bluish color taken for game of naibi. (Cap) c. 16r 14290719 Antonio Mateo of Florence was taken for game of naibi, or cards. (Exe) c. 18r 14290205 Two without name were taken for playing at cards outside the door [or gate]. (Cap) c. 12v 14310521 Uno sanza nome fu preso per giuocho de naibi (battezzato). (Cap) c. 12v 14310529 Una giornea nera e uno capuccio cilestrino tolti a uno che giuchava a naibi. (Cap) c. 13r 14310603 Matteo Melanese da Prato fu preso per giuocho di naibi. (Cap) c. 13v 14310809 Baldassarre di Bartolomeo del popolo di Santa Croce fu preso per giuocho di naibi. (Cap) c. 13v 14310809 Piero di Francia fu preso per giuocho di naibi. (Cap) c. 12v 14310521 One without name was taken for game of naibi (baptized). (Cap) c. 12v 14310529 One black tunic and one pale blue hood removed from one who played at naibi. (Cap) c. 13r 14310603 Matteo, Milanese of Prato, was taken for game of naibi. (Cap) c. 13v 14310809 Baldassare di Bartolomeo of the district of Santa Croce was taken for game of naibi. It is found that at the time the use of the term “cards” or naibi was indifferent for the related game. Also confirmed is the observation of the frequent presence of foreigners and unidentified players among the convicted, as well as those who do not appear because they "escaped." The fact remains firm that this information about card games is only valid as far as it is explicitly registered; not vice versa, usable to exclude its presence when we read only of convictions for games. The purpose of this further research, however, went further: not only to identify card players among those convicted of gambling, but also any players of triumphs among the card players. Personally I was not too disappointed that I have not found any trace of triumphs; if we want to indicate the earliest date (actually, the only) obtainable from documents of this kind we should stop at 1444. Finding those two cases was already an exceptional occasion; the presence of those sentences is not to suggest that the the game of triumphs was strictly prohibited in Florence in those years; we can legitimately assume that in other environments and among other players it was now widespread, so much so as to discover among the playing cards commonly produced and sold in the city even those more recently introduced decks. Even if the fact that for the years 1426 to 1440 no conviction of that sort was not found, we are not permitted to infer that triumphs were still not widespread among the Florentine population. As with other card games, also for the game of triumphs the absence of a witness does not necessarily correspond to the absence of the event of interest. On the other hand, neither is it reasonable to consider the absence of convictions for triumphs as proof that the game existed and was allowed, albeit informally. 5. Data from different archives. In some cases we can do cross-checks with data recorded in several books, and especially with the books kept by the foreign rector during the semester in which he was in office. In this way we can also clarify some items that had remained of uncertain reading. So, for example, a few sentences of this type are recorded also in the Books of the Captain (5). Comparing to the data already reported I can now dissolve the uncertainty about the origin of Baldassare di Bartolomeo: the district that I had failed to read was simply that of Santa Croce (Holy Cross). But the most interesting of these comparisons is that of verifying whether they are the same items or if the specification of the game is only present in some. In particular, some convictions for card games had been reported in the Books of the Captain that are not found in the Books of the Lily, which are simply indicated as convictions for games. Even these examples may be helpful, however, if only to correct some data previously found, including the transcription of difficult to read names, or to add some particular. Thus for 1427 we find (here with only the indication of “game” and not “cards”) Piero Neri Piccolino from Castel San Giovanni and a Giulianodi Guasparre of borough San Felice in Piazza (instead of Antonio Gaspero of S. Felicita; among the saints Felice and Felicita I will have certainly erred, but I hope not also between Antonio and Giuliano). For 1429 we find Ulivieri Antonio of the borough of San Romolo, Bartolo instead of Bartolomeo and Domenico di Martino from Vinegia (instead of Valencia), with the last player who does not pay because baptized, however, registered only for games [gioco] in the Books of the Lily. Similar cases may have occurred for other years and other foreign rectors. Sometimes the opposite case also happens, of card games present in the Books of the Lily and indicated only as a game in the books of the foreign rector. However, the impression is given that the increase in numbers derivable from these cross-checks reveal rather limited results, without dissolving the fundamental question that a significant increase in the fraction of card games to the total games remains hidden forever under the generality of giuocho that we read in these documents. A different case is that of a cross-check that takes into account the activity of conservators of the laws (6). In those documents you will find that the information came primarily from complaints lodged by means of tamburazioni [use of a kind of ballot box for depositing names secretly but not usually anonymously], and many of those cases ended with the acquittal of the one denounced; for this reason it would be useless to look for them in the Books of the Lily. The Books of the Lily from 1426 to 1440 have been examined in order to complete the picture of the results already obtained in previous years and for the ten years after. Attention has been focused on fines for gambling, which unfortunately were the same for the different types of game, from dice to cards, so rarely specified by type. The convictions for games by the foreign rectors showed overall a tendency to decrease over the years but not obtaining certainties on the fraction of card games in the total. Typically we get the impression that the controls were not very strict. The hope (on my part, in fact little) was to find in these books of the Lily not just some further indication on naibi, as indeed has been found, but also on triumphs. To justify such a hope could be considered two testimonies on triumphs found for the year 1444; that case was not at all expected and one could think that even for some previous years we would have again met a surprise of that kind. Regarding card games, few indications are found; not only were none found for triumphs, but advancing into the 1430s there are no longer even explicit records of card games. Because of the insufficient precision of recorded items, the absence in the Books of the Lily examined of sentencing for triumphs – as verified here from 1426 to 1440 - cannot be used as proof that the game does not yet exist, nor, conversely, that it was now considered perfectly acceptable and no longer subject to fines.